with Thomas Agnew and Sons, Manchester. This is a rare composition, where the artist has responded to the landscape before him with great sensitivity. In his early career, Grimshaw painted views, notably in the Lake District, with Pre-Raphaelite intensity and attention to detail. Later, in the 1860s, he enjoyed the friendship of John Linnell. Linnell was the son-in-law of Samuel Palmer, and some of Palmers, and Linnells ideas undoubtedly influenced the younger artist, especially after works by Linnell were shown at the Leeds Infirmary in 1868. Under the Harvest Moon seems imbued with the spirit of English Romanticism. 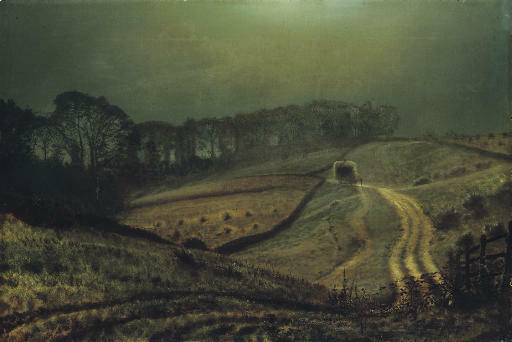 It is an early essay in the 'nocturnes that made Grimshaw famous. The effect of moonlight, on the hanging wood in the distance, the top of the cart laden with hay, and the gently meandering farm track, is expressed with great poetry. As opposed to later suburban lane scenes, which were often repeated, the artist has carefully considered each element of the composition and there is nothing formulaic in his rendition. Dated 1872, the picture stands firmly within the decade where Grimshaw saw his career take wing. He moved to Knostrop Old Hall, outside Leeds, and started to be promoted by Thomas Agnew & Sons, who also had branches in the commercial centres of Manchester, Liverpool and Glasgow, where his work found a ready market.